We know that in order to truly comprehend a text, students must first activate their schema and make meaningful text to self connections. 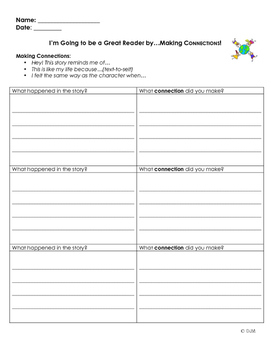 The attached worksheet includes graphic organizers that ask students to first identify what happened in the story (text evidence) and then make a connection. It also includes sentence starters to support your reluctant writers! This independent work is aligned to Common Core. It requires students to analyze text, cite evidence, and use Common Core writing skills to respond. Try using it during "Read to Self", as a library center, or homework.